The race starts at Albert Moser Campground, 9 miles up Cub River Canyon. Be sure to check in at Deer Cliff Inn (8 miles up Cub River Canyon). From the entrance to Albert Moser Campground, head east. In about 100 yards, take a left onto a trail. You climb for 1 ½ miles, then take a right turn onto a 4 wheel trail. In 1 ¾ miles the road/trail veers left, heading north. You make a right turn onto a cow trail, heading east. The trail gets steeper and steeper and about a mile later you are on top of a little peak. You drop over the east side of the peak and head down a very rocky ridge. Soon you come to a trail that gets better as you go. You make a traverse and come to another ridge, where you turn right and drop down for a bit, then go left, traversing through a small canyon, then into some thick trees, dropping down a bit more, and then it levels out and shortly you come to a road and a water stop. You get on the German Dugway road that heads east, and upward for 2 ½ miles to the top of the ridge, then drop down the other side for ½ mile to the Paris Canyon Aid Station on the right. From there you take the highline trail, heading west at first, but shortly cuts back to the southeast, then, heads south. In less than a mile you come to a 4-wheel trail and continue on this trail heading south. You soon come to a maze of trails (take your pick), that climb up through the pines to the top of the ridge, and you continue south on the highline trail. In about 2 ½ miles you take the right fork, staying level, as a left fork drops down to the south. In 2.3 miles you see a sign to Bloomington Lake (left). Continue straight (south), and in a little over ½ mile you come to a rock cairn with signs. Continue straight (south) for almost 4 more miles until you come to a sign on your left. Take a right, heading south for almost a mile to Danish Pass. Turn left and the aid station is about 200 yards away. After Danish Pass Aid, go back to Danish Pass and at the top of the hill, turn left onto a trail, heading south. It is very steep at first, then you top out after 1 mile. The trail is rolling up and down for 1.3 miles, then drops down for a mile, and you come to another short climb. Then you drop down for 3/10 mile and take a left onto a steep, rocky trail for ¼ mile, heading west. The trail smooths out and levels out a bit. In about ½ mile you come to Gibson Basin, and take a left, circling around the north end of the basin. You come to a road, which you cross over and head up a trail. In about ½ mile you top out after a steep climb. You climb a little more, then head downhill for nearly 2 miles to the Beaver Creek Aid Station. From Beaver Creek Aid Station you cross over the main road and head west on a rough road. You stay on this road for 4 ¼ miles and come to a water stop. At that point you go left onto a better road, then shortly veer off to the right onto a 4-wheel trail. In a little over 1 ½ miles a faint jeep trail heads off to the right. The main trail veers left and drops down into a little basin. You have a steep climb on the other side of the basin, then drop down for a mile and come to the Egan Basin road. Take a right, and in 1.7 miles you come to the Danish Pass Aid Station. After your 2nd visit to Danish Pass Aid, you head west to Danish Pass, and as soon as you go over the hill you drop down to the right onto a trail. In 4/10 mile you come to a road, and turn right. In 1 mile you veer off to the right onto a trail for a short distance, then come to a road, and turn right. You go left at the next fork, and continue on this road for ½ mile, then take a right turn onto a better road. In 2/10 mile you take a left onto a dirt road. In about 1 ¼ miles you come to a water stop. Shortly after that, you drop down a very steep, rocky road for 1 ½ miles, then turn right. You see a trail to the left. Veer right again and you climb up for a little over half mile, then drop down and in 1/3 mile you see a water through on the left. Continue another mile to Litz Basin. Look for a left turn onto a trail as the road veers right. You head down to the west on this trail for over a mile, take a right turn, cross a creek, and come to a gate. Cross through, and head up and to the left on a faint, rocky trail heading west. In just under ½ mile to turn right onto a better trail. You soon cross a dry creek bed and head up a rolling single track trail for a couple miles. Then you drop down for 1 mile to the Albert Moser Campground. You go to the entrance to Albert Moser, and take a left onto the Cub River Canyon road. In just under a mile you come to the Deer Cliff Inn Aid Station. After Deer Cliff Inn aid, head back up the road to Albert Moser Campground and enter the campground. Continue to the east end and get on the trail next to the river that cuts back to the right and climbs for about a mile. The trail is mostly rolling for the next 2 miles. You cross a dry creek bed and in 1/10th mile take a left onto a faint trail in a meadow. You go about ½ mile and cross a fence, then cross a creek and head east for about a mile. When you come to a 4-wheel trail you go right (straight). In a little over a mile you see a water trough off to the right. In ½ mile you top out on a hill, and drop down the other side for 2/3 mile, then turn left, then left again onto a very steep, rocky road for 1 ½ miles. When you reach the top you turn right and shortly come to a water stop. In about 1 ½ miles you come to a better road. Turn right. In 2/10 mile you turn left. 3/10 later you take the right fork. 2/10 later you turn left onto a trail for a short distance, then onto a dirt road for another mile. Then you turn left onto a trail for 4/10 mile to Danish Pass You drop over the hill and the Aid Station is 200 yards to the west. After your 3rd visit to Danish Pass Aid you head to the southeast on the Egan Basin road for 1.7 miles, then turn left onto a 4-wheel trail. You climb for a mile, then drop down into a basin, cross over and up the other side, then veer off to the right and down for 1.6 miles. You come to a better road and go left. Soon you are at the water stop, where you head south on a dirt road for 4 ¼ miles to the Beaver Creek Aid station. From Beaver Creek, you head west on a trail that climbs up and veers right for 2 miles, then you mostly drop down for the next mile until you come to a road at the north end of Gibson Basin. You cross over the road, and circle around the north end of the basin. In ¼ mile you take a right turn onto a trail heading westward and upward. In ½ mile you turn right, heading north and climb another 3/10 mile. You drop down for ½ mile, then climb for another mile. It is rolling for the next 1 1/3 miles. Then, you drop down for a mile to Danish Pass, turn right and visit Danish Pass Aid for the 4th time. After Danish Pass (4th visit) you head back to Danish Pass and take a right onto the Highline Trail. In about a mile you see a sign. Turn left and continue on the Highline Trail. In almost 4 miles you pass a rock cairn with signs. Any turn here would be disastrous! Continue northward. In 2/3 mile you see a sign to Bloomington Lake. Don’t go there! The main trail stays left and continues northward. In a little over 2 miles you see a trail come up and join from the left. Continue northward. In about 2 ½ miles you come to a maze of trails that drop down to the right. Any trail will do. They all lead to Paris. About ½ mile after the maze you leave the jeep trail which veers off to the right, and continue straight onto a single track trail. In about a mile you come to the Paris Canyon Aid station. If you take the trail, you will traverse for ½ mile, climb up the ridge, traverse some more, climb some more until you reach the peak, then drop down the west side (very steep) for ½ mile to cow trails for another ½ mile, then left onto a jeep trail for 1 ¾ miles, then left onto a trail, dropping down for 1 ½ miles to Cub River Canyon road, then go right for another mile to the finish at Deer Cliff Inn. You have conquered the Papa Bear 100! This map shows the Mama Bear course, which is 50 miles. 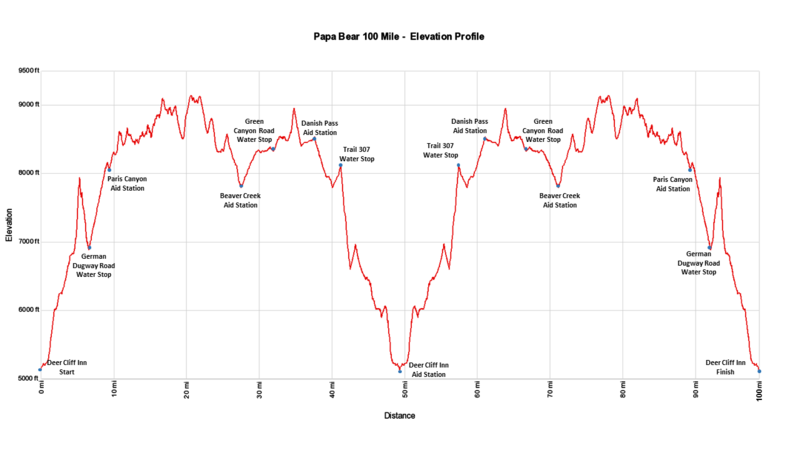 The 100-mile course follows this in reverse 1st, and then follows the Mama Bear 50-mile course as shown.